Perhaps you don’t realize this, but the overwhelming majority of people who laugh do so in spite of, seldom because of anything. In other words, they choose to be happy. This has even been shown to be the case with the professionals (comedians). Many comedians experienced unhappy childhoods and came from difficult situations. Yet in the midst of their pain and problems they learned how to laugh in spite of and eventually were able to make a living by helping other people laugh as well. 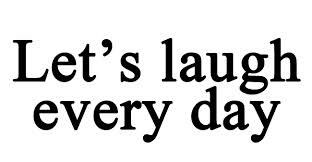 Choose to be happy today; do this by laughing. The key is laughing with people not at them. Do the math – who do you think people want to be around: the sour puss or the person that lifts their spirits? Which version of Christianity do you think will pack the most punch: the sad, solemn version or the upbeat and joyful one? Now that’s worth a good belly laugh. Tags: laughter. Bookmark the permalink. In spite of Pseudo Bulbar Palsy- ALS Onset, which affects the upper motor neuron facial muscles, the joy of the LORD is my strength. I say though I look like I am not smiling on the outside, I am on the inside. My face in the morning Looks like Charlie McCarthy from the breathing mask I have to wear at night! I laugh when I look in the mirror. I thank God for each morning than I have the opportunity to live for Him another day (Psalm 118:24). The peace of God gives me great joy. As I watch my toy poodle pups playing around the house I laugh inside and make laughter noises outside. Even though I can’t speak or have a normal laugh any longer, my thoughts are filled with the joy of the LORD. “A happy heart is good medicine and a cheerful mind works healing, but a broken spirit dries up the bones.” – Proverbs 17:22 . I choose to have a happy heart! Do you? Bless you Billie, you are a special blessing and inspiration! I am so glad you have chosen to have a happy heart–thanks for leading by example.